The film now stands with the global collections of 56.33 crores at the box office. After remaining stable in its 2nd weekend, Sridevi and Nawazuddin Siddiqui starrer Mom has remained steady in the weekdays at the box office. The revenge thriller drama collected 80 lacs on Monday, 95 lacs on Tuesday and 85 lacs yesterday. It now stands with the grand total of 32.41 crores at the domestic market. With the gross collections of 46.67 crores (nett 32.41 crores) in India, Mom has performed decently well at the overseas box office too. Distributed internationally by Zee Studios International, the film has crossed $1.5 million (9.66 crores) in its first week across U.K., USA, Canada, Australia, New Zealand, Singapore, UAE/GCC, Pakistan & Rest of the world. Ravi Udyawar’s directorial debut, Mom, has impressed the cine-goers and critics alike with its strong narrative and exceptional performances. Mom that is setting new trends in the Indian market, promises to do the same overseas as well. Mom marks the 300th film of Sridevi. It also features Akshaye Khanna, Sajal Ali and Adnan Siddiqui in key roles. Apart from Hindi, the film was also released in Tamil, Telugu and Malayalam languages. 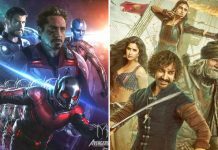 Avengers: Endgame Advance Booking Update (India): Record Breaker On Its Way! Thugs of Hindostan Soon To Be A History? The movie Mom deserves to make at least a 100 crores,because it is by far the best film of 2017 so far. A very well made,excellent performances and apt music score . I hope people who haven’t watched it ,will do so ,but only in a Cinema Hall. The Movie MoM have an outstanding direction by Mr.Ravi and Deviji performed so well she showed her talent on the excellent lines. Sridevi proved that she is still the power bank of Acting. Sridevi showed her spontaneous skills in her role as like her yester movies Himmat Wala, Tohfa, Sadma, Jaag utha insan, Nagina, Mr.india, Chandni , Chaalbaaz, Lamhay, Khuda Gawaah, Heer Ranjha, Gumrah, Laadla, Army, Judaai and off course English Vinglish. She doing her job in a very fantastic way. As a mother she created her expressions in a very control way and the cinegover mismerize after seeing that. She was not overreacted in the whole picture she makes balance in her titular character. Which is remarkable. Sridevi ji well done. You won the hearts.